In the run up to the country’s first election since the coup Unknown Fields headed to Madagascar to catalogue the push and pull of economy and ecology and to trace the shadows of the world’s desires across the landscapes of this treasured island. Travelling with journalists and investigative photographers we uncovered some of the complex value negotiations that play out across this unique island and developed a series of narrative portraits told through statistics, data, predictions, projections, measurements and offsets. Text and images appear courtesy of TANK Magazine where the work was first published. Text by Sohrab Golsorkhi-Ainslie, Photography by Chris Littlewood, Footage by Toby Smith, Graphic by Unknown Fields. Mirana stands on a pile of displaced earth in Manalobe, close to the epicentre of the relatively recent gemstone boom in Ilakaka. The ground beneath her feet conceals sapphire deposits, laid down along an ancient subterranean riverbed left over from when the island was still attached to the Indian subcontinent. One cubic metre of dirt and gravel can contain as much as a gram of sapphire – five carats’ worth – which could fetch more than $5000 internationally. Mirana is paid $2 per day to work the mine. Tsinjo stands in a rice paddy on the outskirts of the capital, Antananarivo. Once the crop is harvested each year he uses the mud to make bricks, forcing it into moulds by hand; the bricks are left in the sun to dry before being fired in stacks. The bricks drying in the sun behind him are worth 70 Ariary ($0.03). The rice field sinks lower and lower each year, until it is useless for both rice and bricks and becomes waste ground, bereft of value. Mahefa is a zebu herdsman from Ihosy who walked for a week with his 50 zebu to get to the Ambalavao zebu market, the second largest on the island. Along the way he and his family had to defend the herd from rustlers. For people in rural Madagascar a zebu is the highest symbol of wealth, imbued with both economic value and cultural significance. More useful to hold than cash, an adult zebu yields around 160 kilograms of meat and costs between $400 and $660 at the market. Mahefa will try to trade his adult zebu for calves to take back to Ihosy. In almost every region in Madagascar, the zebu is a key part of the culture, whether in rites of passage that involve stealing a zebu from a nearby village or sacrificial banquets held when the head of the family dies. Rakoto has dug up this rice field in Ivato, north of Ranomafana National Park, in the hope of finding tiny deposits of gold that fetch $1333 per ounce on the international market (price accurate on 14/08/13). He and his family pan the mud in specially irrigated pools on adjacent fields. Several years ago he made the calculated decision that he could make a better living searching for gold than from subsistence farming in the rice fields. Researchers at the Centre Valbio inside Ranomafana are testing pilot schemes to introduce more modern agricul-tural techniques to the region and provide alternative livelihoods mostly based on ecotourism, hoping to reduce the temptation for villagers to destroy the forest in search of food and gold. Seven-year-old Mamy stands on a pile of rocks that he and members of his family have been salvaging for sale from an abandoned quarry near Toamasina. In the distance behind him is the Ambatovy processing plant this quarry was excavated to build. Family groups of six to eight, mostly comprising women, older men and children, work to extract the final grains of value from the waste left behind by the Ambatovy project, which has to date cost an estimated $6.9 billion. Axe in hand, Pepe treks along the path into Masoala National Park in search of firewood, as there is no alternative fuel source. It is estimated that 150,000 hectares of rainforest are cleared each year in Madagascar, primarily for firewood and agricultural land. The fishermen on the eastern coast of Madagascar, like coastal communities all over the country, are facing increased competition from migrants from the interior. There, the combination of a growing population and overworked arable land has forced people to the coast in search of food. The aggressive fishing techniques they employ (including the use of poison) devastate fish stocks, which are then difficult to replenish. As a result, fishermen whose knowledge of managing stocks has been handed down over generations are forced to travel further than ever along the coast and out to sea in search of fish. The Unknown Fields Division is a nomadic design studio that ventures out on expeditions to the ends of the earth to explore peripheral landscapes, industrial ecologies and precarious wilderness. These landscapes – the iconic and the ignored, the excavated, irradiated and the pristine – are embedded in global systems that connect them in surprising and complicated ways to our everyday lives. They are the dislocated hinterlands that lie behind the scenes of modern cities. Each year we navigate a different trajectory as we seek to map the complex and contradictory realities of the present as a site of strange and extraordinary futures. Here we are both visionaries and reporters, part documentarians and part science fiction soothsayers as the otherworldly sites we encounter afford us a distanced viewpoint from which to survey the consequences of emerging environmental and technological scenarios. Join the division for our next expedition. The Unknown Field Division is coordinated by Liam Young and Kate Davies. Unknown Fields Division leaders Liam Young and Kate Davies are interviewed for Thinking in Practice Issue 15. In the article they cover Mega-cities, apocalyptic narratives, Peripheral territories, fictions as infrastructure, the shadows of urban development and the urgency to define new modes of practice in architecture. Embedded journalist and designer Jessica Charlesworth joined the division for the final leg of our Alien Encounters road trip from Roswell, New Mexico to the Burning Man Festival. Jessica has documented her time with the division in this long post on CORE 77. You can also follow the division prepare their expedition as we build our old school bus as a solar powered nomadic studio , then we load it up with our Burning Man survival gear, and raid Walmart for water and supplies. You can also see all of Jessica’s photographs from the expedition in the core 77 Unknown Fields gallery. In Blueprint magazines roundup of the top graduates of 2012 4 graduates from Unknown Fields Strange Times: Far North Alaska studio have been recognized. Congratulations to Alex Laing for his project Ghost in the Spectrum, Dessislava Lyutakova for Harmonic Frequencies, Reo Suzuki for Theater for History Yet Unseen and Samantha Lee for Sedna, Landscape Supercomputer. The awards follow on from the success of last years Never Never Lands: Outback Australia studio, where 4 graduates were also included in the same list. Unknown Fields co founder Liam Young has been interviewed for UNCUBE Magazine’s issue 5 Apocalypse soon! On the eve of the Mayan Apocalypse UNCUBE marks the impending new age with an issue on the Architecture of Catastrophe, the conditions of failure, and the design solutions that prepare us for the end and what comes after. You can read the article by Julia Albani online now. Also stay tuned for the work of our Winter 2012 studio that traveled to Central America on the 2012 summer solstice for front row seats to the end of the world. 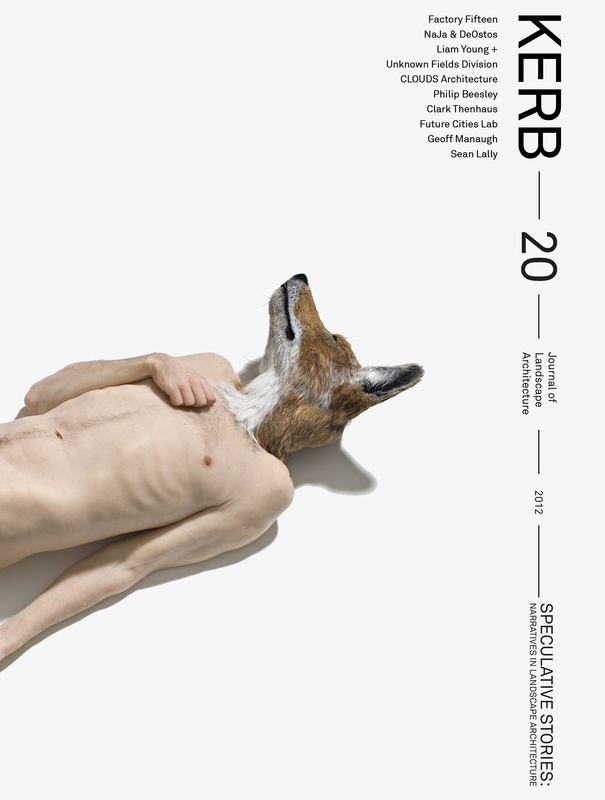 KERB 20 is out now and features new projects by Unknown Fields Division. Other contributors include division co founder Liam Young, Factory Fifteen, Philip Beesely, Future Cities Lab, Geoff Manaugh (BLDGBLG) and many more. You can purchase your copy here http://www.melbournebooks.com.au/kerb-20.html. Kerb Edition 20 examines ways in which speculative narrative discourse can be applied to landscape architecture. Through exploring Fabricated foundations, Fossilisation of information, and Contemporary unfoldings, we can navigate new horizons for the narratives of landscape architecture that propel beyond responsive tracings, and position new navigations; forms of resistance to the existing knowledge. It is through this view in landscape architecture that exploration is facilitated of both new possibilities and of their implications. In Blueprint magazines roundup of the top graduates of 2011 4 graduates from Unknown Fields Never Never Lands: Outback Australia studio have been recognized. Congratulations to Ed Pearce for his project Toxic Garden, Aram Mooradian for A Comprehensive Atlas of Gold Fictions, Samantha Lee for Sacred Anomalies, and Oliviu Lugojan-Ghenciu for Gravity One: A choreography for Militarized Airspace. As part of an ongoing collaboration with Archis + Volume and the Unknown Fields Division have co authored VOLUME 31: Guilty Landscapes. VOLUME joined Unknown Fields on ther Summer 2011 expedition form the chernobyl Exclusion Zone to Baikonur Cosmodrome and this research, developed alongside Unknown Fields previous missions to dislocated hinterlands around the world have informed the issues theme. Guilt has been effectively used to control and manipulate the masses. But it can also be the start of a change for the better: awareness, concern, action. Engagement and guilt are never far apart. Engagement is sublimated guilt. We can build on guilt, but can we build with guilt? Is guilt a material to design with? You can see the table of contents or check out a sneak preview of the issue. In three sections: revelations, confessions, and atonement, the issue presents a global scan of large-scale guilty landscapes and our design relation to them. A major section is dedicated to the Chernobyl ‘exclusion zone’ as a post nuclear disaster area, with other contributions focusing on landscapes transformed by mining industries, waste, human atrocities and more, as well as ways to atone for these criminal acts. The Unknown Fields Division has been profiled in the debut issue # 1 of JOTTA magazine. The issue is a fold out poster-filled compendium of artists and designers that charts a dialogue, travelling from obsolete ecologies through to contemporary depictions of a new nature, celebrating those speculating on possible futures and altering the present. Check the JOTTA release page for more info or go here to buy a copy of the issue for £5. Science Fiction Soothsayers: A Trip wit hthe Nomads of the Unknown Fields Divsion. “Unknown Fields Division, the interdisciplinary studio at the Architectural Association School, embark on annual expeditions around the world to explore and draw ideas from surreal landscapes and obsolete ecologies. We talk to UFD co founders Liam Young and Kate Davies, as well as participants of the 2011 summer journey through the abandoned futuristic sites of the former Soviet Union.” Article by Lemma Shehadi.